In large bowl, measure cereal; set aside. In 1-quart microwavable bowl, microwave chocolate chips, peanut butter and butter uncovered on High 1 minute; stir. Microwave about 30 seconds longer or until mixture can be stirred smooth. Pour mixture over cereal, stirring until evenly coated. Pour into 2-gallon resealable food-storage plastic bag. 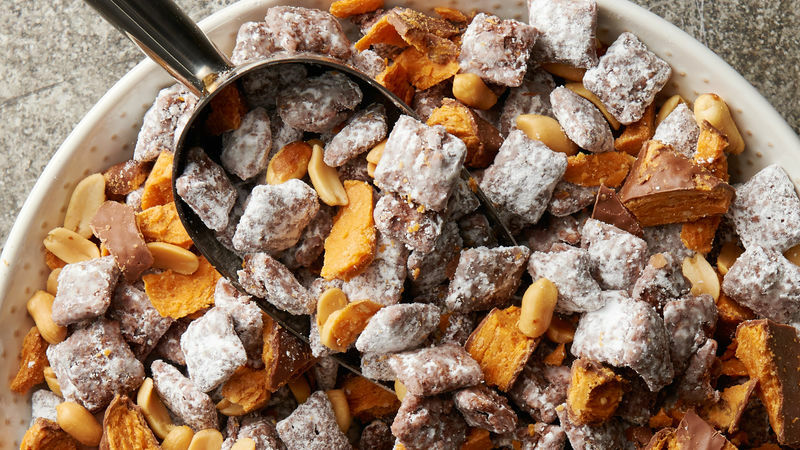 Stir in peanuts and chopped candy. Store in airtight container. Can also use any combination of Corn Chex™ cereal or Rice Chex™ cereal. 15 fun-size (0.65 oz each) candy bars can be substituted for 5 full-size bars.